. ‘Look out, Look up!’ before you start work in any areas where electricity lines are present.
. Risk assess and be aware of the height of machinery that will be in use near lines and ensure there’s plenty of clearance – remember that electricity can ‘jump’ if an object comes near enough.
. If you do come in to contact with an overhead line or cable, stay in your cab or vehicle and try to avoid touching anything metal within it.
. Call 105 immediately – this is the UK-wide single emergency number for power companies and is the quickest way to put you through to the correct network operator. 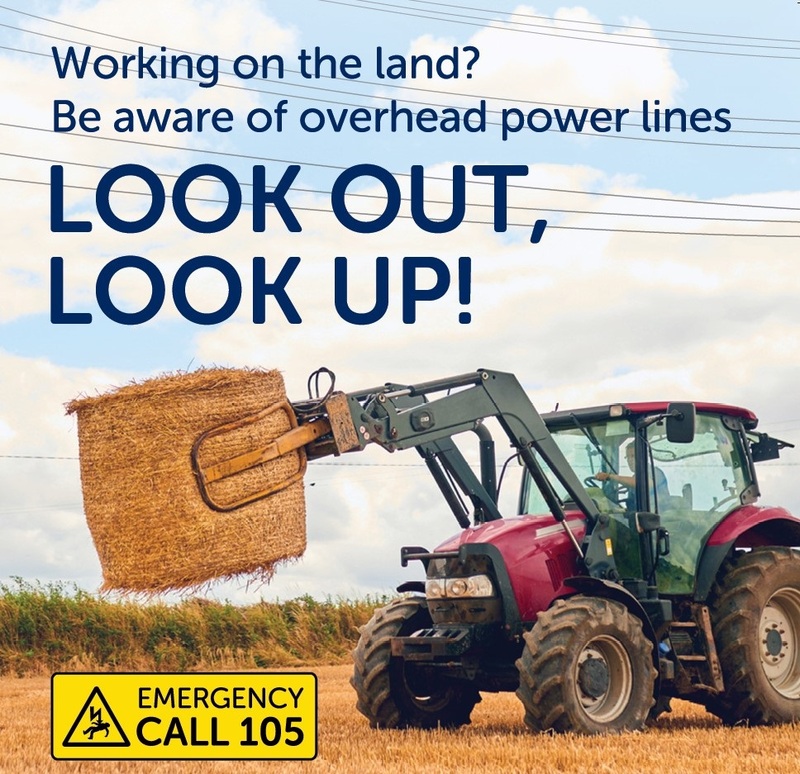 “Our rural landscape changes throughout the seasons and the ‘Look out, Look up!’ message encourages anyone working in the field to take stock of their surroundings and the overhead lines that may run across, or into the land. Trees and hedgerows may have grown since the last time you checked and could now obscure nearby lines, intense heat in the summer can cause lines to sag slightly and working with different styles or heights of machinery may bring you closer to the lines than in previous years.